The Civil War is, for the American imagination, the great single event of our history. Without too much wrenching, it may, in fact, be said to be American history. Before the Civil War we had no history in the deepest and most inward sense. There was, of course, the noble vision of the Founding Fathers articulated in the Declaration and the Constitution--the dream of freedom incarnated in a more perfect Union. But the Revolution did not create a nation except on paper; and too often in the following years the vision of the Founding Fathers, which men had suffered and died to validate, became merely a daydream of easy and automatic victories, a vulgar delusion of manifest destiny, a conviction of a people divinely chosen to live on milk and honey at small expense. The vision had not been finally submitted to the test of history. There was little awareness of the cost of having a history. The anguished scrutiny of the meaning of the vision in experience had not become a national reality. It became a reality, and we became a nation, only with the Civil War. The Civil War is our only ``felt'' history--history lived in the national imagination. This is not to say that the War is always, and by all men, felt in the same way. Quite the contrary. But this fact is an index to the very complexity, depth, and fundamental significance of the event. It is an overwhelming and vital image of human and national experience. Fully one-third of the recorded events of armed conflict of the Civil War occurred in Virginia, where the proximity of Washington, D.C., and Richmond--capitals of the opposed camps--spurred campaign after campaign. The passing of the armies in Virginia left an indelible impression upon the American cultural landscape, endowing posterity with the resonance of such names as Manassas and Bull Run, Malvern Hill, Chancellorsville, Fredericksburg, Wilderness, Spotsylvania, Cold Harbor, Petersburg--and others less well rehearsed--Seven Pines, Gaines' Mill, Cedar Run, Chantilly, North Anna, and Yellow Tavern. Few regions in the United States have experienced the horrors of systematic destruction, and the memories are still close to the surface for many long-time Valley residents. Family histories are filled with stories that relate to the hardships of that time. It took a generation to repair the ravages of ``The Burning'' and another generation before life in the Valley returned to its pre-war condition. There can be found there today a fierce pride in ancestors who survived the war and who struggled to rebuild all that was lost. 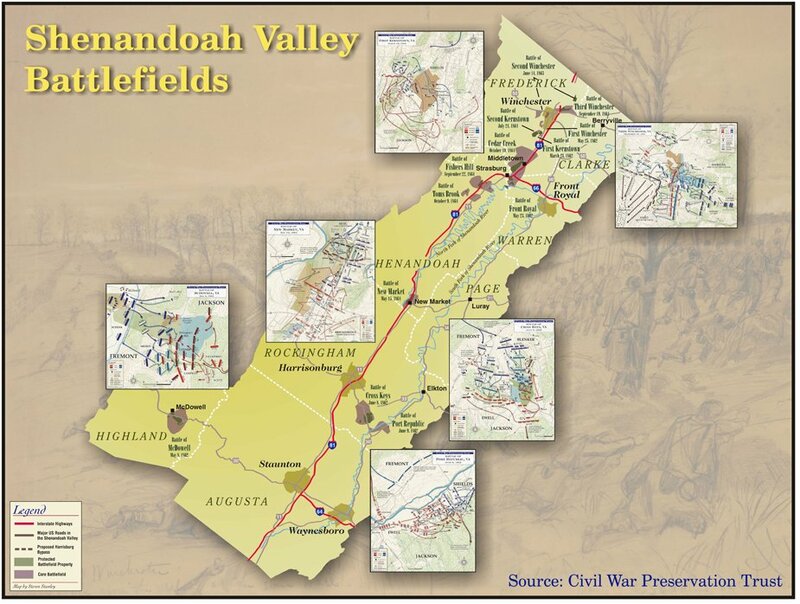 Official chronologies record 326 incidents of armed conflict in the Shenandoah Valley during the Civil War: 6 battles, 21 engagements, 21 actions, and 278 skirmishes, on the average one conflict every 4-5 days. This reckoning does not include many of the raids, ambushes, and partisan affairs that made warfare in the Valley a daily dance with death. More than half of the recorded armed conflicts occurred in the final year of the war. Map 6 shows how these events plot out in terms of frequency with the reddest areas showing most frequent fighting and the bluest areas showing least frequent fighting. The history of the Civil War in the Shenandoah Valley bears witness to the devastation and waste of warfare, but more importantly, it underscores the irrepressible human will to survive, to rebuild, to carry on. These lessons will continue to have relevance for generations to come. The historic events and the human players of the Valley--the heroic and the tragic alike--have contributed significantly to the texture of our American cultural heritage. 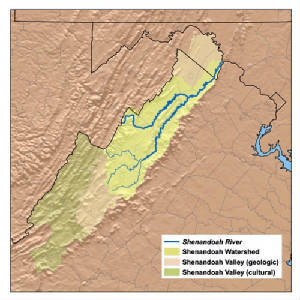 The Shenandoah Valley is that portion of the Great Valley of Virginia that is drained by the Shenandoah River and its affluents. The Valley extends on a southwest to northeast bearing, from its headwaters north of Lexington to the Potomac River, a distance of about 140 miles. For convenience, the Valley can be said to extend from Lexington to the Potomac River, although the watershed in the immediate vicinity of Lexington drains south to the James River. The Shenandoah Valley is bounded on the northwest by North Mountain, the first range of the Allegheny Mountains, and on the southeast by the Blue Ridge, which separates the Valley from the Piedmont region and coastal plain of eastern Virginia. The distance from Washington to the Blue Ridge at Snickers Gap is about fifty-five miles; from Richmond to the Blue Ridge is about a hundred. At its widest, the Valley is nearly twenty-five miles across. North of the Potomac River, the Valley continues into Maryland and Pennsylvania with a similar configuration, but there it is called the Cumberland Valley, and the Blue Ridge is named South Mountain. The Shenandoah Valley encompasses two counties in West Virginia: Berkeley and Jefferson; and seven counties in Virginia: Frederick, Clarke, Warren, Shenandoah, Page, Rockingham, and Augusta. 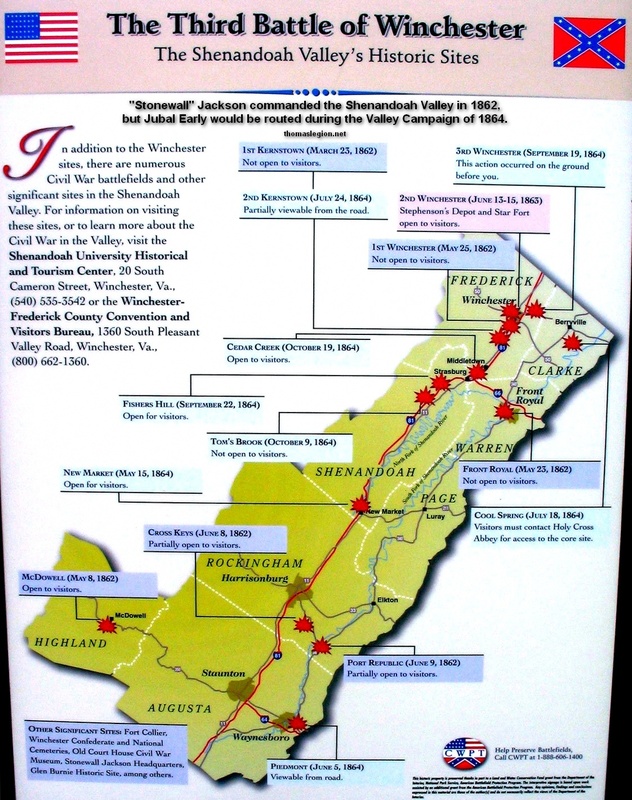 Highland County has been included in the study region because of its intimate association with Jackson's 1862 Campaign, even though it is beyond North Mountain. Berkeley, Jefferson, Frederick, Clarke, and Warren counties are referred to as the Lower (downstream) Valley; while the counties south of Strasburg are called the Upper Valley. The Shenandoah Valley's unique feature is Massanutten Mountain, a complex ridge that extends for some fifty miles through its middle, from Strasburg southwest to Harrisonburg. Throughout its length, the Massanutten divides the Valley into two smaller valleys, the main or Strasburg Valley, which is drained by the North Fork Shenandoah River, and the narrower Page or Luray Valley, drained by the South Fork Shenandoah River. Just south of Strasburg, the main Valley is only about five miles across, while on the far side of the Massanutten, the Luray Valley funnels down to a width of less than a mile and a half at the town of Overall (antebellum Milford). From the general vicinity of Lexington, a series of small streams flows northerly; these combine to form the South River near Waynesboro, the Middle River near Staunton, and the North River near Bridgewater. The North and Middle rivers conjoin west of Grottoes, and the South River merges a few miles downstream at Port Republic to form the South Fork Shenandoah River. Port Republic marked the upstream limit for seasonal navigation of the river, hence its name. The South Fork flows down the Luray or Page Valley to Front Royal. The North Fork Shenandoah River arises from the many small streams that spring from Shenandoah and North Mountain west and south of Timberville. The river's largest tributary--Smith Creek--joins near Rude's Hill at Mt. Jackson. Two other important tributaries join farther downstream--Stony Creek at Edinburg and Narrow Passage Creek near Woodstock. From here the river meanders northeast through a series of incised meanders, known as ``Seven Bends.'' At Strasburg, the North Fork turns abruptly east across the head of the Massanutten, where it is joined by Cedar Creek. At Front Royal the North and South forks conjoin, forming the Shenandoah River proper, now several hundred yards wide. From Front Royal, the Shenandoah flows steadily to the northeast along the flank of the Blue Ridge to empty into the Potomac River at Harpers Ferry. At the time of the Civil War, locks on the Potomac River allowed access to the Chesapeake and Ohio (C&O) Canal, which carried canal boat traffic to Georgetown. For the last forty miles of its journey to the Potomac, the Shenandoah River is paralleled on the west by a meandering, high- banked stream called Opequon Creek, or simply the Opequon (Oh- PECK-n) which arises in the vicinity of Winchester and drains the western portion of the Lower Valley, emptying into the Potomac River. The Valley Map of cartographer Jedediah Hotchkiss (produced 1862- 1863) reveals an intricate web of turnpikes and farm roads within the Valley, reflecting its densely settled agricultural character at the time of the Civil War. In most places, the modern network of State and county roads is congruent with the historic network. The primary historic Valley highways and roads are in use today. 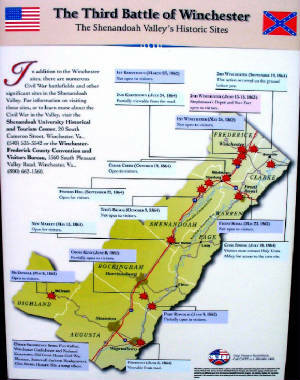 The major northeast-southwest thoroughfare of the Shenandoah Valley at the time of the Civil War was the Valley Turnpike, which extended from the Potomac River at Williamsport via Martinsburg, Winchester, Middletown, Strasburg, New Market, Harrisonburg, Staunton, and Fairfield to Lexington. This road is one of the oldest and most historic transportation routes in America. In prehistoric times, Indians followed buffalo herds along its route. Later it was referred to as the Warrior Trace. The first settlers entered the Valley from Maryland, crossed the Potomac River at Williamsport, Shepherdstown, and Harpers Ferry, and followed the road south. In the 18th century, it was part of the Great Wagon Road, which ran from Philadelphia to the back country of the Carolinas and the Cumberland Gap. When it was incorporated as the Valley Turnpike (a toll road) in the 19th century, it had already contributed mightily to the settlement of the American frontier. In the 20th century, first US 11 and then I-81 were laid out to follow its course. In the 19th century, the Valley Turnpike was part of a fledgling State transportation network of turnpikes, local roads, railroads, and canals. It boasted a macadamized surface that enabled travel in wet weather. The army that controlled this road had the advantage of being able to move swiftly up or down the Valley, while its enemies bogged down on the muddy side roads. Not surprisingly, most of the Shenandoah Valley's battles and smaller engagements were fought somewhere along the Valley Turnpike. Two dirt roads ran parallel with the Turnpike for most of the distance between Winchester and Staunton, and these roads were used extensively in conjunction with troop movements along the Turnpike. The Back Road, which skirted the flank of Little North Mountain, was known for years as the Cattle Road after the herds that were once driven north along its route to market. The Middle Road traced a meandering course between the Back Road and the Valley Turnpike. These routes today are followed by paved county roads. The placement of the major east-west routes through the Valley depended on the location of gaps through the Blue Ridge on the east and through the Alleghenies on the west. The Blue Ridge gaps were low and relatively numerous, while only a few natural gaps in the North Mountain of the Alleghenies allowed settlers to penetrate farther into the interior. Roads were built through these gaps to carry traffic into West Virginia and to the Ohio River. The modern road network utilizes many of these natural gaps. Winchester was a vital transportation hub in the Lower Valley. Including the Valley Turnpike (sometimes known as the Martinsburg Turnpike north of town), nine important roads or turnpikes radiated from the city. North of town, the Old Charles Town Road (rte. 761) diverged from the Valley Turnpike at Stephenson's Depot, leading to Harpers Ferry via Summit Point and Charles Town. The ``Berryville'' turnpike (modern VA 7 east) led through Snicker's Gap to Bluemont (antebellum Snickersville) where branches continued to the seaport of Alexandria via Leesburg (Leesburg and Snicker's Gap Turnpike, Leesburg and Alexandria Turnpike) and through Aldie (Snicker's Gap Turnpike) to Fairfax Courthouse on the Little River Turnpike. From Winchester, the Winchester and Berry's Ferry Turnpike (US 50 east) ran southeast through Ashby's Gap. The Front Royal and Gaines's Crossroads Turnpike (US 522 south) led south to the town of Front Royal. Middle Road (rte. 628) led south to Strasburg and Cedar Creek Grade or Cedar Creek Turnpike (rte. 622) led southwest to Cedar Creek Gap. The North Western Turnpike (US 50 west) left the Valley by Petticoat Gap on its way to Romney. Just beyond the gap, the Hardy and Winchester Turnpike (rte. 608 south) diverged southwest to Moorefield in Hardy County via Wardensville. The North Frederick Turnpike (US 522 north) led west and north to Hancock, Maryland. Because of its strategic location in the Lower Valley, Winchester changed hands an estimated 72 times during the war, as the armies repeatedly advanced and receded. Five major battles (three at Winchester, two at Kernstown) and many smaller engagements (including Rutherford's Farm and Abrams Creek) were fought in the vicinity. Front Royal, situated at the confluence of the North and South forks of the Shenandoah River at the head of the Massanutten, was a second important transportation node. In addition to the turnpikes leading north to Winchester and Berryville, roads ran west to intersect the Valley Turnpike at Strasburg (VA 55 west), east through Manassas Gap to join the Warrenton Turnpike at Gainesville (VA 55 east), and southeast through Chester Gap to Massie's Corner (US 522 south). The Luray and Front Royal Turnpike (US 340) led southwest through Page County along the course of the South Fork to Luray. From Luray, the New Market and Sperryville Turnpike (US 211 east) crossed Thornton's Gap to Sperryville, where roads branched northeast to Warrenton and southeast to Culpeper Courthouse. Heading west from Luray, the turnpike crossed Massanutten Mountain to New Market, from where it continued (VA 211 and 259) to Brock's Gap in Little North Mountain. The Luray Road (US 340) continued south to Waynesboro via Shenandoah, Elkton, and Port Republic. Harrisonburg, situated on the Valley Turnpike near the base of Massanutten Mountain, was an important crossroads. The Swift Run Gap Turnpike (US 33 east) passed along the base of the Massanutten via Elkton over Swift Run Gap to Gordonsville. From Harrisonburg, a road (US 33 west) led into the Alleghenies through Dry River Gap to Franklin, West Virginia. The Warm Springs Turnpike (VA 42) led southwest into Bath County. An important Blue Ridge crossing in this area, which led from Port Republic through Brown's Gap (rte. 663) to Charlottesville, no longer carries modern traffic. From Harrisonburg, the Valley Turnpike (US 11 south) continued to Staunton where it intersected the major east-west thoroughfare of the Upper Valley--the ``Parkersburg Road'' (US 250). This road actually comprised three turnpikes on its course from central Virginia to Parkersburg, West Virginia. From Charlottesville, the Rivanna and Rockfish Gap Turnpike led to the gap where it entered the Staunton and Scottsville Turnpike, leading to the city. From Staunton west, the Staunton and Parkersburg Turnpike passed through Buffalo Gap to reach Parkersburg via McDowell and Monterey. Staunton's location at the intersections of the Valley Turnpike, the Parkersburg Road, and the Virginia Central Railroad, made it the most vital transportation center of the Upper Valley. It was an important supply and staging area for Confederate armies operating in the Valley until the summer and fall of 1864, when it was repeatedly ravaged by Union forces. Deserving notice are several other Blue Ridge gaps, which are sometimes mentioned in historic accounts. Seven miles south of Harpers Ferry is Keyes Gap, crossed by VA 9 from Charles Town into Loudoun County. Six miles farther south is Gregory's or Wilson Gap, which is no longer in use. Between Chester Gap and Thornton's Gap above Luray, were two minor gaps, which are not in use today--Gravelly Spring and Beham's gaps. East of Waynesboro near Rockfish Gap is a cluster of little-used gaps--Turk's, Jarman's, and Beagle. Farther south are Howardsville Gap, Reed's Gap (rte. 664), and Indian or White's Gap (US 60 east), which carries the road from Lexington and eventually to Richmond. Of these many gaps, Snickers, Ashby's, Manassas, Chester, Swift Run, Brown's, Thornton's, and Rockfish gaps are most often mentioned in Civil War literature. Crucial for understanding military operations in the Shenandoah Valley were the railroads. By 1860, about 1,600 miles of railroads had been built in Virginia. The Baltimore & Ohio (B&O), Winchester & Potomac (W&P), and Manassas Gap railroads traversed the Lower Valley; while the Virginia Central served the Upper Valley. The most important of these railroads in terms of volume of traffic was the B&O Railroad, which ran from Baltimore to Wheeling, West Virginia, via Harpers Ferry, Martinsburg, and Grafton. The B&O served as a major east-west transportation artery for the North and remained in Federal hands on-and-off for most of the war. As a vital rail, river, and canal junction, Harpers Ferry was occupied by the Confederacy early in the war and later served as Union general Philip H. Sheridan's principal base of operations for his 1864 campaign. The Confederates raided the B&O throughout the war at Harper's Ferry, Duffield's Depot, Martinsburg, and elsewhere. The B&O was severed repeatedly, but the North's ability to repair damage and keep the trains running outstripped the South's ability to disrupt the railroad. When West Virginia was admitted into the Union in 1863, the West Virginia Panhandle (Jefferson, Berkeley, and Morgan counties) was added to the new State in a bid to maintain control of the B&O Railroad, even though most of the citizens of those counties supported the Southern cause. The W&P Railroad ran from Winchester to Harpers Ferry via Charles Town, a distance of 32 miles. Farther south, the Manassas Gap Railroad ran 78 miles from near Mt. Jackson via Strasburg, Front Royal, and Manassas Gap to Manassas Junction where it joined the Orange & Alexandria Railroad (O&A). Before the war, these railroads carried the produce of the Lower Valley to the markets of Baltimore and Washington. By 1862, both the W&P and the Manassas Gap had been thoroughly dismantled. The Union army made some attempt to repair these railroads in 1864 but abandoned the effort because of the activities of Col. John S. Mosby and his partisan rangers. Serving the Upper Valley, the Virginia Central Railroad ran more than 195 miles from Jackson's River Depot near Covington to Richmond--via Buffalo Gap to Staunton and via Rockfish Gap Tunnel to Charlottesville and beyond. Between Charlottesville and Gordonsville, the Virginia Central used the same tracks as the O&A, enabling connections to Lynchburg and points south, or Culpeper, Manassas, and Alexandria to the north. From Gordonsville, the Virginia Central continued east via Hanover Junction to Richmond. This railroad carried vital supplies from the Valley to the Confederate capital (with disruptions) well into 1864. Throughout the Civil War, Confederate armies used the Shenandoah Valley as a natural corridor to invade or threaten invasion of the North. Because of its southwest-northeast orientation, Confederate armies marching down the Valley approached Washington and Baltimore, while Union armies marching up the Valley moved farther away from Richmond. The Blue Ridge served as a natural screen for the movement of troops. By defending the gaps with cavalry, Confederate armies could move swiftly north behind the protective wall of the Blue Ridge into Maryland and Pennsylvania; General Robert E. Lee did this in the Gettysburg Campaign in 1863, as did Jubal Early in 1864. The Blue Ridge offered similar protection to Lee's army during its retreats from Antietam and Gettysburg. On the whole, Confederate armies succeeded in preventing deep Union penetration of the Upper Valley until late in the war, and Valley geography cooperated with the defense. Where the Massanutten Mountain rises abruptly between Front Royal and Strasburg, the width of the Valley is greatly decreased. With strong infantry at Fisher's Hill in the main valley south of Strasburg and cavalry at Overall (antebellum Milford) in the Luray Valley, a Confederate general could effectively hold the Upper Valley against a numerically superior enemy. Fisher's Hill astride the Valley Turnpike was an important strategic ``choke point'' throughout the war. Thomas Jonathon “Stonewall” Jackson used Massanutten Mountain to screen his offensive movements in the 1862 Valley Campaign. Crossing from New Market to the Luray Valley in May, he advanced on Front Royal and then on Winchester, forcing the Union army, then at Strasburg, into abrupt withdrawal. Later in the campaign, he prevented two Union columns advancing against him up the main and Luray valleys from reuniting and defeated each separately in the climax of his campaign at the battles of Cross Keys and Port Republic. The Shenandoah Valley was referred to as the ``Granary of Virginia.'' It was the richest agricultural region in Virginia, and its abundance supplied the Confederate cause. Because a large number of the inhabitants of Frederick, Shenandoah, Rockingham, and Augusta counties were pacifist Quakers or Dunkers who refused to fight in the war, the Valley continued to produce horses, grains, and livestock even after other portions of Virginia were made barren by the flight of slaves or the enlistment and conscription of the farmers. As the war continued, the City of Richmond and the Army of Northern Virginia, pinned down in the trenches at Richmond and Petersburg, came to depend more heavily on produce shipped from the Valley on the Virginia Central Railroad. Capturing the supply depot of Staunton and severing this railroad became a major objective of the Union armies in 1864. As the war dragged on, the Shenandoah Valley increased in importance to the Southern cause, and correspondingly it became more urgent that the Northern armies succeed there after dramatic failures in 1862, 1863, and May 1864. Ultimately, the Northern army was forced to lay waste to the agricultural abundance of the Valley in order to destroy support for the Southern war effort.